Putting out the Welcome Mat! ShareASale has added 210 new merchants in the last two months and we would like to introduce you to a few! You can view a listing of all our newest programs here, or get instant notification with the New Programs RSS feed! Careerbags primarily sells laptop bags for women and laptop totes so we are a perfect fit for fashion and technology. Our selection fits all types of careers, personal styles and budget. Our average sale is $136.00. We pride ourselves in a personal shopping experience and customer relations. We have cause related marketing partnerships and will offer additional opportunities for women’s professional, health and charity organizations. Clark Street Sports offers the deepest selection of Chicago Pro Team apparel and souvenirs. Although we specialize in Chicago Cubs, Bulls, Bears, White Sox and Blackhawks fan apparel, we also offer t-shirts, sweatshirts and jerseys for all MLB and NFL teams. Clark Street Sports is a proud partner with Majestic Athletic in a Custom/Personalization program for MLB licensed t-shirts and jerseys. Currently our average sale online is $50.08. MORE Trend Nation LLC sells men’s and women’s accessories including cufflinks, wallets, bags, and more! We are offering a 12% commission on all sales on any of our website. We sell thousands of major name brand items at great prices for both men and women. is a global company is headquartered in Bowling Green, Kentucky producing underwear and casual wear. Our colorful T-shirts and underwear are known by consumers in all corners of the globe and our name is synonymous with providing quality, value and style. Staying true to our roots and close to our heritage, our collections are authentic, timeless and unmistakably Fruit of the Loom. At SunburstSuperfoods.com your visitors will find a customer-friendly environment where they can purchase high quality Superfoods at some of the best prices on the internet. We strive to offer organic, raw, non-GMO, and vegan Superfoods, dried at low temperatures, to supply a bounty of vitamins, enzymes, and nutrients for super health. We are dedicated to finding the highest quality Superfoods available and educating our customers about the remarkable reported benefits of these wonderful foods.MORE Earn commission for sales of the Total Beauty Collection, a package of 4-6 full or deluxe-sized beauty samples from top cosmetics brands for only $15. Shipping is free and we usually include a gift with purchase. A new collection with different products goes on sale each month. Total Beauty will pay a bounty of $4.50 for each package sold. The average sale is $15. Unlike other programs, we do not require customers to sign up for a subscription or long-term commitment. We may offer affiliates special affiliates-only discounts. US Salon Supply is a beauty distributor featuring a complete selection of over 19,000 products in stock. VeryJane.com – Handmade and Boutique deals at up to 80% off delivered right to your inbox every day! Follow us to get in on the action! We offer 10% commission for all sales.PowerRank 100 Merchant! Copyright © 2012 ShareASale.com. All Right Reserved. Hi! I'm Sarah, the Director of Client Services for ShareASale.com. 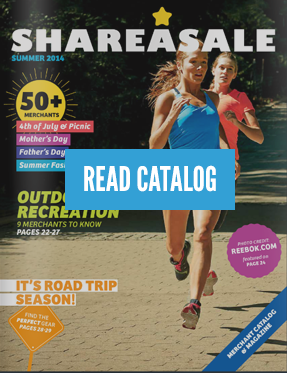 I came to ShareASale in 2005 and am responsible for providing strategic guidance and educational resources to Merchants & Affiliates that can be used to grow their accounts. My favorite thing in the world, aside from affiliate marketing of course, is traveling. Random fact: my first concert ever was Neil Diamond when I was 4. As a result, I know an alarmingly large number of Neil Diamond songs. Don’t be a hater.